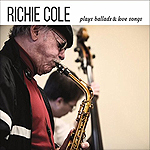 CD review: "Richie Cole Plays Ballads & Love Songs"
This review first appeared on Nov. 25, 2016 at AllAboutJazz.com. Alto saxophonist Richie Cole has made quite the career with his brand of hard bop, generally coming at melody almost as an unintended consequence of his heavy focus on improvisational interpretation. On his latest release  itself an unintended consequence of a recording date arriving without half the scheduled musicians able to attend  Cole taps into his inner Johnny Hodges. Caressing, gentle, lush, it is a side of Cole that’s never been explored over a full album before. The same man who turned the almost decadent “Moody’s Mood” into a post-modern experiment on a 1975 album, who four years later took “Hooray for Hollywood” into a nearly unrecognizable orbit, whose often hectic playing earned him the sobriquet of “Alto Madness,” here embraces pure melody like he rarely has before. The focus of “Plays Ballads & Love Songs” is on richness of tone, on holding a note until it’s almost too late, on a nearly vocal approach to each song. On the opening track, “Spring Can Really Hang You Up the Most,” Cole’s lead is, well, practically leisurely  an adjective rarely used to describe his playing. Rather than charging ahead, he sits back, following just behind the beat  it is relaxed, in fact. Now, fairness demands we point out that none of this is complete surprise or even wholly out of character for Cole. On his 1992 outing, “PopBop,” he even had strings behind him on some pretty traditional arrangements of “Spanish Harlem” and “When You Wish Upon a Star.” (Of course, he also had a rock-infused bop version of “La Bamba,” and an appropriately Monk-ish reading of “Straight, No Chaser” on that album.) He’s shown a nice touch on ballads here and there throughout his recording career. What sets “Plays Ballads & Love Songs” apart, though, is having an entire album consistently in a downtempo vein. A huge part of the charm  and success  for this unexpected foray into an extended after-hours vibe has to be credited to guitarist Eric Susoeff. Playing with a relaxed late-night feel and a big fat tone, reminiscent of Barney Kessel, Ed Bickert or Garrison Fewell, Susoeff’s sympathetic openings on “Bewitched, Bothered and Bewildered,” “Alfie” and “Chances Are” set the table perfectly for Cole’s subsequent leads. And when Susoeff solos, it builds on what Cole laid down, complementing it in spirit and approach. He is a near-perfect foil for Cole here. The rhythm section of bassist Mark Perna and drummer Vince Taglieri is likewise elegant and swinging, creating a smart, sophisticated canvas for Cole and Susoeff. Cole does show a touch of his Alto Madness persona on “Sunday Kind of Love,” storming out in the first bar. But where a more typical Cole arrangement would have used that as a springboard to ever more distant extrapolations, here he brings it back - not dialing back the energy nor the creativity, but keeping the melodic theme of the song more intact, more the focus. Overall, it is a delightfully different outing from Cole, an album that should become a favorite despite running against the grain of his career.